Just when you thought you had Goldfrapp figured out, they throw you for a loop one more time. Alison Goldfrapp's metamorphosis from eccentric trip-hop songstress to overtly sexual glam pop diva was a masterstroke from the start, both artistically and commercially. Forgoing the sumptuous, pastoral evocations of electronica with partner-in-crime Will Gregory on the debut album Felt Mountain, the duo switched from mystery to jarring directness on 2003's Black Cherry and 2005's Supernature, Gregory's throttling beats evoking the then-in vogue German schaffel sound (which in turn was heavily derived from the UK glam rock of the early 1970s), Alison's lyrics brimming with lust. After the critical acclaim Felt Mountain garnered, this time the record-buying public in Europe and the UK followed suit, singles like "Train", "Strict Machine", "Ooh La La", "Ride a White Horse", and "Number 1" charting well enough to establish Goldfrapp as one of the more reputable pop acts of the last few years. That said, after the stunning debut and its equally disarming follow-up, for all its merits Supernature felt like Will and Alison were backing themselves into a corner. Sure, the musical formula was a fabulous one, but for the first time that element of surprise that endeared Goldfrapp to many just wasn't there. Thankfully, nearly two and a half years later, they're pulling the rug out from under us once again. The release of Seventh Tree is one of those situations where a record label is forced to wear that uneasy smile, immensely proud of supporting an artist with that much integrity, but weeping deep down inside, worrying about the certainty of lower sales figures. Equally odd for Mute Records to have to deal with is just how severely Goldfrapp has changed direction on its fourth disc. No contagious dance beats? No blunt come-ons? Acoustic guitar? Mellotron? Who do they think they are, Feist? Mercifully, unlike the Apple-shilling Canadian, while Seventh Tree embraces the acoustic influences of Nick Drake and the airy melodies of late '60s Beatles, the record never slips into bland, Starbucks soundtrack territory. It might be a quieter and more introspective disc than we'd been expecting, but this is still a quintessential Goldfrapp album with Gregory's arrangements brilliantly underscoring the inimitable vocal versatility of his female foil. 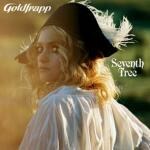 Even on their last two albums, Goldfrapp has never shied away from the mellower tracks, but the way Seventh Treegets off to such a subdued start just might throw some longtime fans off. "Clowns" is a sublime opener, Alison's gentle singing mirroring the indecipherable yet hypnotic style of Elizabeth Fraser from the Cocteau Twins, strings and synths adding a John Barry-like cinemtatic quality to the track. "Eat Yourself" continues in a similar direction, Alison cooing away, bass and percussion innocuously entering the fray. Meanwhile, the whimsical "Happiness" puts an electronic twist on the oft-imitated Sgt. Pepper sound, those trademark Goldfrapp synth hooks fitting right in. "Little Bird", though, is even better, unabashedly using psychedelic imagery and plenty of sonic gimmicks like reverse playback and mellotron, everything with the kind of sweeping coda the Flaming Lips wish they could still pull off. Sequenced like a vinyl LP, there's a distinct divide between Seventh Tree's two halves and after the somewhat staid first "side". "Some People" is the album's turning point, a ballad in the same vein as "Black Cherry", piano and strings giving way to Alison's richly layered vocals. "Cologne cerrone Houdini" revisits the dignified, enigmatic tones of Felt Mountain, but again, with a more organic feel than ever before. The rollicking "Caravan Girl" is shockingly conventional, a straight-ahead four-on-the-floor rocker, but a relentlessly catchy and playful one at that, a welcome change of pace. The album's real treasure, though, is "A & E", which ranks among the duo's very finest moments. Here Alison ditches all the nature-obsessed poetry and cryptic wordplay, going for pure, desperate emotion instead, her aching character sketch of a woman coming to in "a pastel ward" of an emergency room is devastating. Unlike any other previous Goldfrapp single, "A & E" strips the sound bare, the more simplified approach proof that it's indeed possible mature as songwriters without ever sounding boring.